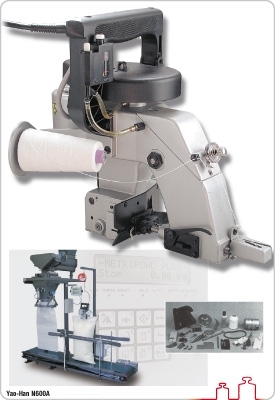 ﻿ Sewing machines - Yao-Han N-600/A | Metripond Plus Kft. High speed, new type sack sewing machine with oiling system. It can be ideally used for closing sacks containing agricultural products, animal feed, chemical fertilizer, flour and other chemical materials. Fully comprehensive maintenance, supply of parts, renting and exchange machine. On request available with sprung suspension, "C" hook or coupled with a sacking scale. Sale of thread. - For the closure of sacked agricultural products, animal feed, chemical fertilizer, flour, etc.